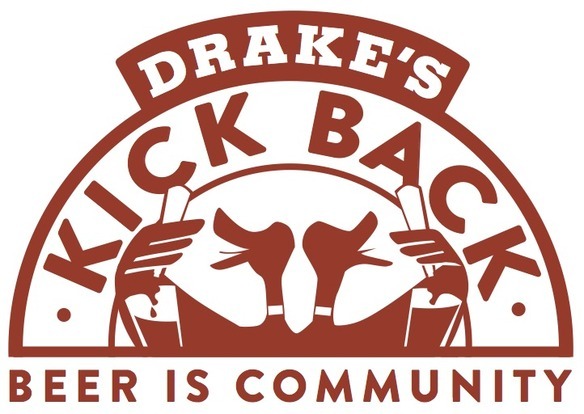 Yes yes yes, Lost Drakers… tonight is again First Friday, our block-party-style shindig that takes over the parking lot once a month for the benefit of humanity- specifically the humanity sitting in our local schools, as well as you nice people who donate thousands every month. 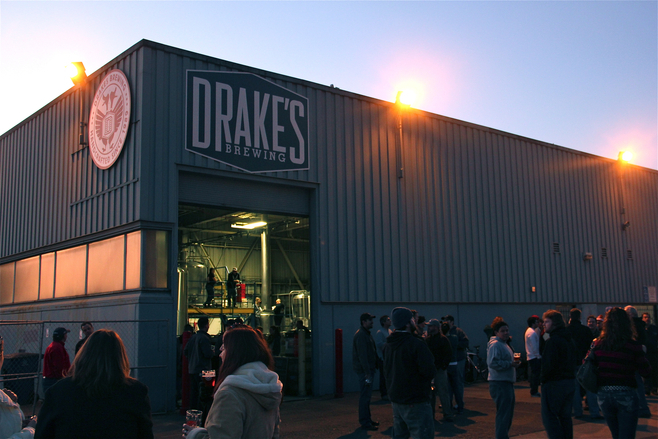 Our next First Friday, right here at Drake’s, will be on Friday, April 3 from 4-8 pm, benefitting the Washington Elementary Dad’s Club and Assumption School. Licensed 2 Grill and Brew! 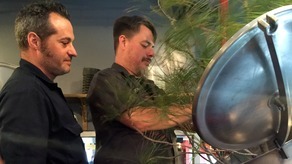 Kitchen will be here servin’ up dinner. 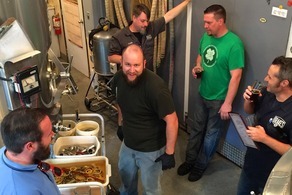 opportunities, so we got together with Great Basin Brewing Co for a RCBW collaboration brew that’ll be released at their Sparks brewpub on Tuesday, April 21.
veterans who predate Nevada’s burgeoning craft beer scene to make sure we make ourselves the biggest little splash we could in Reno. And with that relationship forged, we’re set to release a Belgian Dubbel brewed with foraged ingredients from both the Golden & Silver States. alongside a spicy bite German hops are renowned for. 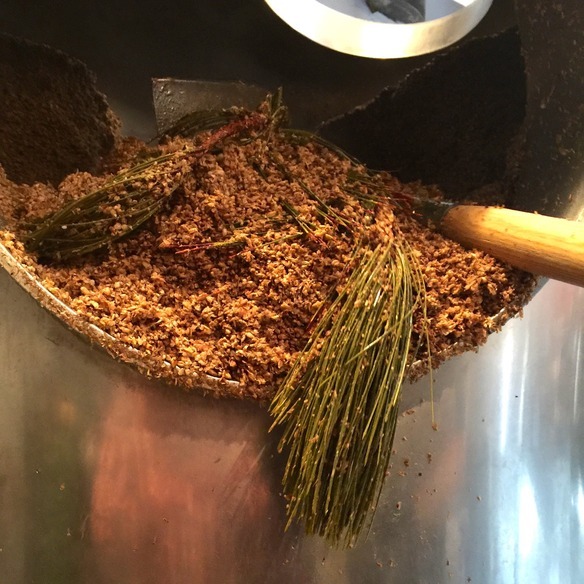 Having both was essential, considering the rest of this ingredient list: foraged California spruce & cedar in the mash, spruce in the boil, and the final addition that still awaits: a tea brewed from Nevadan desert sage & juniper that will be added post-fermentation, much like the traditional Finnish sahti. We landed on these additions as a way to not only bring together brewers from CA & NV, but also to bring together the lush greens of California with the desert brush of Nevada for a truly representative brew of these two longstanding Western brewhouses & our respective brewing histories. Drake’s has maintained a barrel program dating back decades, and in the last few years, it’s grown wildly- no pun intended- with a small army of people wrangling oak & bugs. 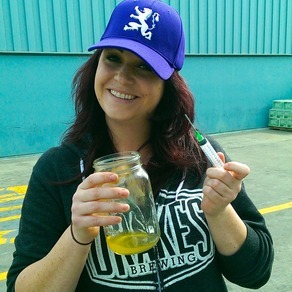 One of the newest people on the barrel team is Alyssa Doty, who’s worked her way through keg-flippin’ and tour-givin’ to work full time in our barrel program, headed up by barrelmaster Travis Camacho. How’d the idea for Manhattan project come about? What was your first step? Probably should have seen that answer coming. What were the next steps? Well, the classic Manhattan has sweet vermouth, bitters, and cherry. The barrel provided the cherry, so it was just a matter of rounding the rest out. 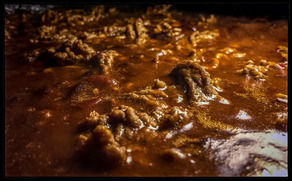 I played around with chipotle and even granny smith apples, but decided simpler would be better. So I went with a combo of vanilla, allspice, star anise, and a pinch of cinnamon to re-create the sweet vermouth, and then orange peel for the bitters. 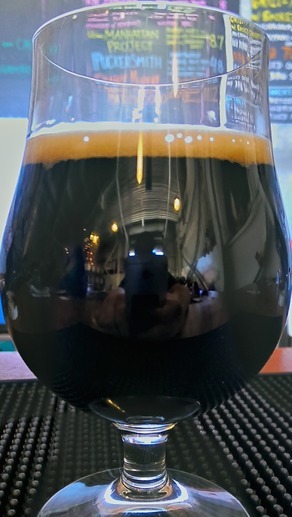 With the heft of the barrel-aged robust porter, it ended up just about where I wanted it. 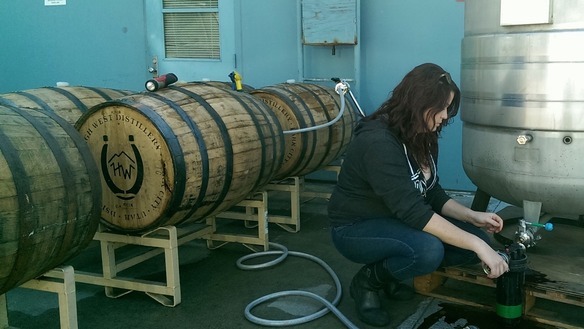 OK, now what’s the weirdest thing you’ve had to do in the barrel program? Deliver live crabs to Travis at home. Didn’t really have anything to do with the barrel program, though. 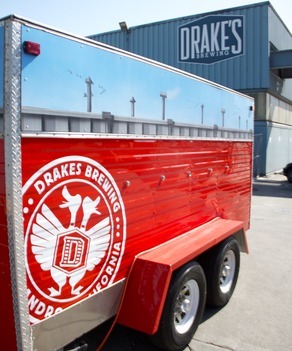 The Manhattan Project, at 8.7% ABV, is on tap at Drake’s Barrel House today. based in the San Francisco Bay Area, with access to an outdoor event space and ability to provide 20 volunteers the day of a Kick Back event. If you can do all that, you can fill out our Kick Back application form, and we might just bring First Friday (or third Tuesday) to you. 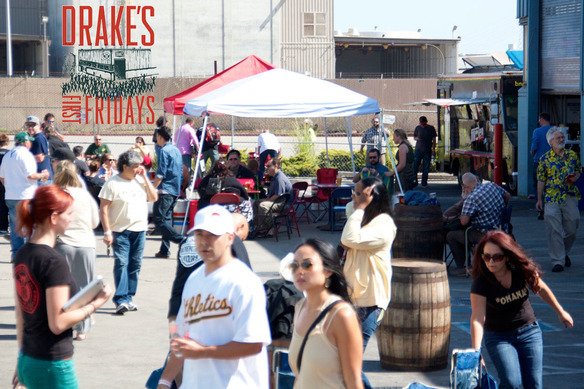 It’s practically a cliché, but beer really is about community, as the throngs of people we see every First Friday proves, and we’ve been supported by the Bay Area for over 25 years- it’s our pleasure to return the favor for the next generation of Bay Area residents & brewers. Meant to come this joint out for a while, but haven’t found the right time? If you’re a Warriors or A’s fan, we do have a couple suggestions- we’re just a few exits/BART stops away from the Coliseum & Arena where the Ws continue to blow the rest of the NBA out of the water and the A’s return to Oakland tomorrow to build on their 2014 campaign. We’re open seven days a week for a pre-game pint or a sixer to go, so stop by & pair the best basketball in the Pacific with the best beer. If you would like more information or directions for any of our events feel free to contact us online or call us at (510) 568-BREW (2739). You might have spotted the above setup in Zymurgy a few months ago… yeah, that’s our event staffer Nick up there. 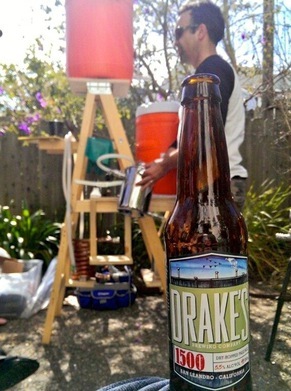 It’s pretty safe to say that while we may be a production brewery, we’ve had that homebrew spirit in our veins ever since 1989, so if you, noble homebrewer, have a question about brewing great craft beer, feel free to ask our brewers at breweranswers@drakesbrewing.com. 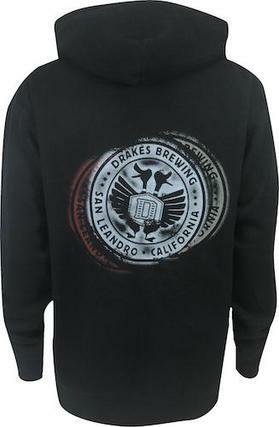 Our online store is chugging away at drakesstore.com. We’ll be re-stocking and adding new items every season, so keep checking back for more beer-adjacent goodies.